Experimental and chemical studies in guinea pigs on contact allergy caused byChrysanthemum indicum L. (Chrysanthemum of the florists) led to the isolation of several sesquiterpene lactones. From the crude extract of dried flowers 12 fractions were obtained of which four gave strong reactions on epicutaneous application to guinea pigs sensitized with an extract of C.indicum L.
One of these allergens was identified as a sesquiterpene lactone of the guaianolide type. It is identical to Arteglasin-A derived fromArtemisia douglasiana Bess. The occurrence of Arteglasin-A inChrysanthemum indicum L. as well as its allergenic properties are described for the first time. These findings give rise to the assumption that the other, as yet unidentified sesquiterpene lactones of this flower also belong to the guaianolide type. Part I and II of this series are references 1 and 2. A preliminary report of this article is reference 34. 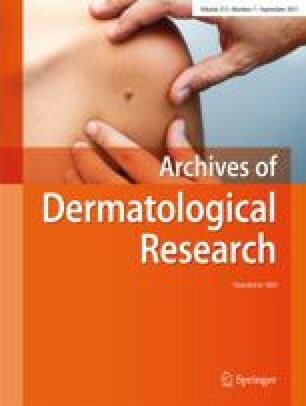 Reprint requests to: Dr. B. M. Hausen, Department of Dermatology, University Hospital Hamburg, Martinistr. 52, D-2000 Hamburg 20, Federal Republic of Germany. Chemische Untersuchungen und experimentelle Teste an Meerschweinchen bezüglich der durch Chrysanthemen verursachten Kontaktallergie führten zur Isolierung mehrerer Sesquiterpenlaktone. Aus dem Rohextrakt getrockneter Chrysanthemen wurden 12 Fraktionen isoliert, von denen vier im Epikutantest bei sensibilisierten Meerschweinchen eine stark positive Reaktion ergaben. Eins der Allergene wurde als Sesquiterpenlakton vom Guaianolid-Typ identifiziert. Es ist identisch mit Arteglasin-A ausArtemisia douglasiana Bess. Sowohl das Vorkommen von Arteglasin-A inChrysanthemum indicum L. als auch seine allergene Wirkung werden hier das erste Mal beschrieben. Die Untersuchungsbefunde lassen vermuten, daß die anderen bisher nicht identifizierten Sesquiterpenlaktone ebenfalls dem Guaianolid-Typ angehören.